Libertad, because it is an Afrocolombian community, has the right to a special form of communitarian leadership called a Community Council. This year, the leadership decided to create an Advising Council of Women in order to guarantee the voices of women in the community are heard. 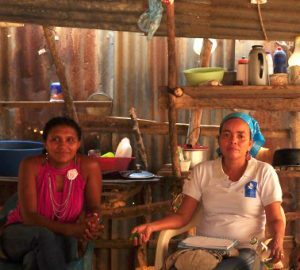 A respected teacher and leader of Libertad was named to head the Advising Council and has formed a group of six women to meet biweekly, discuss the needs of women in the community, plan projects and events specifically for women, and motivate women to participate in the processes in the community. A first event is planned for June 4th: a movie night in which the female leaders will introduce the group, give a talk on self-esteem and self-value, and present a movie – A League of Their Own. Sembrandopaz accompanies the spaces with the women to support in the planning of activities and projects as well as their development as leaders and understanding of their rights and community processes. The Alta Montaña is a region made up of 54 communities that are working together to demand their rights, overcome the aftereffects of the violence lived, and share their story with the world. The leadership is comprised of leaders from different communities in the region in order to represent the different needs and views; however it is largely men with several women. Last year, the leaders suggested that Sembrandopaz organize a retreat for their wives and the women leaders. 20 women participated in the space, dialoguing about their identity as a woman, as a part of the peaceful process in the region, and formed friendships with women they might not have had the opportunity to meet otherwise. At the end of the retreat, Sembrandopaz committed to continuing to support the women in creating more spaces of integration in their communities so that they could empower other women to get involved and informed about the processes in which their communities participate. Example: One woman decided to take up Sembrandopaz on the offer. Her community, Tierra Grata, recently held elections and she suggested to the new leadership that they form a Women’s committee. She, along with a friend, decided that they best way to communicate the idea to the women of the community and motivate their participation in the committee, would be to have a Mother’s Day party. In years past, the community held large celebrations for Mother’s Day, but it has been several years since they have done the tradition. The two women asked for the support of Sembrandopaz in order to make the event happen and it was a huge success: food, games, poetry, prizes, and lots of participation of women in the community! The women shared the idea of forming the committee and it was well received; several women expressed interest in joining the committee. Mampuján is an Afrocolombian community that suffered displacement 16 years ago but has actively looked for ways to peacefully demand their rights and move forward in life. While the community has yet to move back to their original town, they have come a long way in calling attention to their situation and making the government fulfill promises. One of the community leaders, Juana, has devoutly worked to support and involve women throughout the process. Women Weaving Dreams and Flavors of Peace began as a form of trauma healing: the women meeting to depict their stories and traumas on cloth, creating a safe space to talk about what happened, express emotions, and be able to let the suffering out in order to be able to move forward. Through the years, the group of women has shared this process with other communities in the country. Last year, Women Weaving Dreams and Flavors of Peace won the National Peace Prize in Colombia for their work. Sembrandopaz has accompanied the women in the processes and continues to be honored to work alongside these strong and dedicated women. Currently, Juana and Sembrandopaz are organizing a three day event to teach 15 more women in the region the art of trauma healing through tapestry making, the idea being that the process now can serve as a way to heal and a means of income for the women. Pichilín is a small farming community where the first massacre of the region occurred 20 years ago. Managing the trauma and effects of the armed conflict has been a difficult process for the community. Over the past year, the women of Pichilín have been formally meeting to document the community’s history and starting the trauma healing process. As a part of this process, Sembrandopaz invited the Women Weaving Dreams and Flavors of Peace from Mampuján to lead workshops with the women of Pichilín. After two weekends together, the Women Dreamers of Pichilín had created tapestries depicting how their community was before the armed conflict and what happened during the violence. The women continue to meet once a month, now sewing tapestries depicting their dreams for their futures and the future of Pichilín. Sembrandopaz accompanies these spaces and continues to provide support in the trauma healing process using group therapy methods during the meetings. The women are currently imagining new ways to get more women in the community interested in participating in the group since they have found the experience invaluable. The Student Collaboration Projects this year are just getting started! With students now just getting out for summer break, the teachers are taking advantage of the free time to meet with the young girl leaders and decide the projects that they will develop this year! Projects are currently being created in Mampuján, Pichilín, and for the first time in Libertad! At the end of last year, the female leadership groups that realized projects in the communities had a retreat in Libertad to share their experiences and form friendships with girls from other communities. This space motivated the girls to continue with their projects and being organizers and leaders amongst their peers. That being said, the girl leaders in Mampuján and Pichilín have continued their projects even after the formal process was completed. The group in Pichilín has continued presenting their traditional dances in community events and schools; they even held a raffle to raise more money in order to travel. The group in Mampuján continues to meet with Juana and Lani to finish sewing their tapestries showing how life was when their family members lived in Mampuján before the displacement.